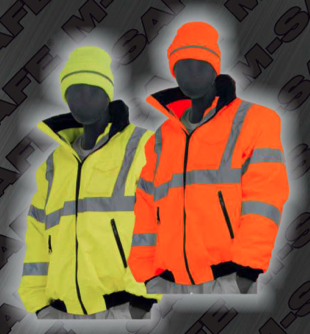 Looking to buy safety jackets in Rochester NY, Ithaca NY, and Western NY at competitive prices & with exceptional service? The Duke Company proudly carries the finest Safety Jackets – ANSI 107-2010 Class 3 8-in-1 Bomber Jacket in High Visibility Yellow and High Visibility Orange. 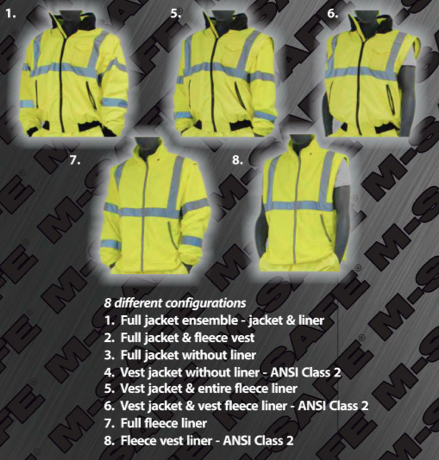 Remarkably, offers eight different wearing configurations including basic, fully lined CL3 waterproof jacket, CL2 vest, just a High Visibility CL3 liner and an additional set of four options that enable your professional crew to adapt to a wide range of operating conditions. Convenient radio and hand-set straps. Collar is made of durable fleece.